CHICAGO, IL--(Marketwire - January 18, 2011) - NanoInk's® NanoFabrication Systems Division is pleased to announce that the Institute of Photonics at the University of Strathclyde, Glasgow, U.K., purchased an NLP 2000 to be used for applied photonics and nanophotonics. NanoInk's NLP 2000 System is a desktop nanofabrication system that allows researchers to rapidly design and create custom engineered and functionalized surfaces on the micro and nanoscale, using Dip Pen Nanolithography® (DPN®) to transfer minute amounts of materials over a large, environmentally controlled work area. The Institute of Photonics plans to use the NLP 2000 specifically for the deposition of soft materials to existing structures to generate optical effects, color conversion and for laser fabrication. "We are excited by our initial results using the NLP 2000 in the deposition of optical materials and polymers. The patterning of soft materials using tip-based lithography builds strongly on our existing expertise and capabilities in microLED arrays. As an applications-focused research unit, we believe that many exciting research opportunities will stem from this technology," said Simon Andrews, business development manager for the Institute of Photonics. "We are also very encouraged by NanoInk's focus on supporting application development with a view towards future commercial exploitation." "The ability of the NLP 2000 to generate patterns of optical materials on scales wavelength or sub-wavelength dimensions is clearly aligned with the strategy and capability of the Institute of Photonics," said Robert Marchmont, general manager of Europe, the Middle East and Africa, NanoInk. 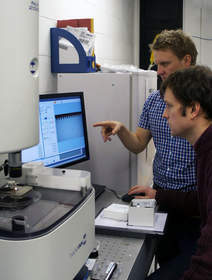 "With three of NanoInk's DPN systems installed in close proximity, and the strong collaboration between Professors Martin Dawson, Peter Skabara and Duncan Graham, the University of Strathclyde has developed into a key center of excellence for DPN in optical nanoscience." NanoInk's NanoFabrication Systems Division brings sophisticated nanofabrication to the laboratory desktop in an easy to use and affordable setting. For sales information, please email: sales@nanoink.net. More information is available at: www.nanoink.net/divisions.html#NanoFabrication. The Institute of Photonics, established in 1996, is a commercially-oriented research unit, part of the University of Strathclyde. The Institute's key objective is to bridge the gap between academic research and industrial applications and development in the area of photonics. The University of Strathclyde is a leading university, meeting the needs of students, employers, industry and the wider community through its teaching, research, consultancy and knowledge transfer. Strathclyde is located in the heart of Glasgow, and is Scotland 's third largest University. More information is available at: www.photonics.ac.uk. NanoInk, Inc. is an emerging growth technology company specializing in nanometer-scale manufacturing and applications development for the life sciences, engineering, pharmaceutical, and education industries. Using Dip Pen Nanolithography® (DPN®), a patented and proprietary nanofabrication technology, scientists are enabled to rapidly and easily create micro-and nanoscale structures from a variety of materials on a range of substrates. This low cost, easy to use and scalable technique brings sophisticated nanofabrication to the laboratory desktop. Headquartered in the Illinois Science + Technology Park, north of Chicago, NanoInk currently has over 250 patents and applications filed worldwide and licensing agreements with Northwestern University, Stanford University, University of Strathclyde, University of Liverpool, California Institute of Technology and the University of Illinois at Urbana-Champaign. For more information on products and services offered by NanoInk, Inc., visit www.nanoink.net. The NanoFabrication Systems Division provides core desktop instrumentation and application expertise for current and future applications of DPN. The Nano BioDiscovery Division provides instruments, assay kits, and contract services for nanoscale protein detection using DPN technology. The NanoStem Cell Division aims to revolutionize the utility of stem cells through the application of DPN nanopatterning. The NanoProfessor™ Division provides a complete nanotechnology educational solution including a suite of instruments, interdisciplinary-based curriculum, cutting-edge labs, and comprehensive educator and program support developed to extend hands-on nanotechnology education to the undergraduate classroom. The NanoGuardian™ Division uses NanoEncryption™ technology to offer pharmaceutical customers a state-of-the-art on-dose brand security solution to fight counterfeiting and illegal diversion. NanoInk, the NanoInk logo, Dip Pen Nanolithography, DPN , NanoGuardian and NanoProfessor are trademarks or registered trademarks of NanoInk, Inc.
Dr. Robert Stokes (left), from NanoInk and Dr. Nicholas Laurand (right), from the Institute of Photonics at the University of Strathclyde, look at a substrate being patterned using NanoInk's NLP 2000. The Institute of Photonics plans to use the NLP 2000 specifically for the deposition of soft materials to existing structures to generate optical effects, color conversion and for laser fabrication.